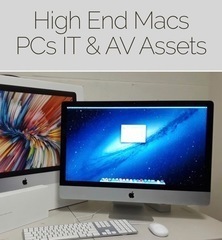 M21924 IT reseller is liquidating 100s of Mac and PC, notebooks, A/V and technology assets. Shipping available! AUCTION CLOSING DATE: Friday, December 14th, at 12:07 pm. Bidding closes on the first item at 12:07 pm, then closes at the rate discussed in these Terms and Conditions of Sale.